Before a quitclaim deed can be recorded with a county recorder in Mississippi, the grantor must sign and acknowledge it. The names, addresses, and telephone numbers of the grantors and grantees to the quit claim deed, along with a legal description of the real property should be provided on the first page (89-5-24). For further guidance, formatting and legibility requirements pertaining to the recordation process are provided in 89-5-24 of the Mississippi statutes. 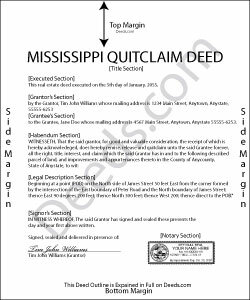 In the process of recording a quit claim deed in Mississippi, affidavits relating to marital status and identification may be required to accompany the document (89-5-8). A quit claim deed must be recorded in the county where the property is located. In Mississippi, a quitclaim deed will not be valid against a purchaser or any creditor for valuable consideration without notice unless it is recorded in the county where the property is located. After a quit claim deed is filed by the recording clerk, the priority of the time of filing will determine the priority of all conveyances of the same land as it concerns the several holders of such conveyances (89-5-1). An unrecorded conveyance or one that has not been filed for record will not take precedence over a similar instrument affecting the same property that has been recorded. With reference to instruments that have been filed for record, the priority is governed by the priority in time of filing of the several instruments, in the absence of actual notice (89-5-5). DAVID JOHN M. said: The Transfer On Death Deed did work for New Mexico! Though I did have to add the long property description to the "Exhibit" page that was included with the document. Great website! Will use again! Thanks!! !